Find out more about Napoleon Dynamite's Liger as well as discover t-shirts featuring the illustration of the mythical animal. The movie Napoleon Dynamite is about a high school student who has nothing to prove. Indeed, one of the subtitles for the movie is "He's out to prove that he's got nothing to prove." In doing this he behaves in some rather odd and unfashionable ways. Napoleon sees being cool as being equal to possessing skills. During the movie Napoleon is proud of his drawing skills and also makes mention of his ability with a bowstaff! It is a weird fantasy that Napoleon lives in as he attempts to use a time machine, attends Rex Kwon Do classes and casually mentions his nunchucks. However, it is his knowledge and appreciation of Ligers that makes one of the most memorable quotes from Napoleon Dynamite. On this page I present Napoleon Dynamite's Liger. Napoleon Dynamite is proud of his drawing skills and is sketching in the vicinity of the girl he wants to impress, Deb. She asks Napoleon what he is drawing and his reply is "A Liger", which is followed up by "It's pretty much my favorite animal. It's like a lion and a tiger mixed, bred for its skills in magic." This is said very casually, to show how familiar Napoleon is with Ligers. The Napoleon Dynamite Liger quote is featured on the right. 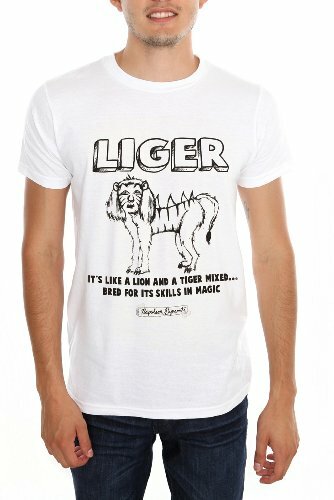 For anyone else who wants to cause awe and wonder with their knowledge of Ligers this t-shirt is a great way to remember one of the funniest quotes from the movie Napoleon Dynamite. In the past I tried my hand at drawing Ligers to impress girls and from my experience it does not work. In fact my latest Liger illustration prompted my wife to ban them from the house! Black Liger T-shirt featuring the mystical animal illustration by Napoelon Dynamite. Napoleon Dynamite light gray t-shirt which features the famous Liger sketch. Yes, they are. A Liger is a hybrid animal resulting from crossing a male lion with a female tiger. Ligers are only found in captivity and grow to be the largest cats on earth. One thing that Ligers are not know for, however, are their skills in magic; in fact they are not known to possess any magical ability at all - they cannot even perform simple card tricks! Wikipedia entry about this hybrid creature. A website devoted to Ligers. Youtube slideshow of the world's biggest Liger. Everything you could possibly want to know about Ligers. 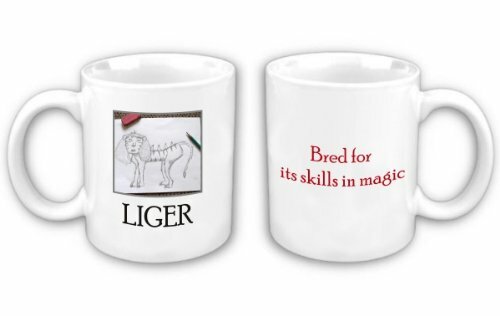 Here is a nice gift for Napoleon Dynamite fans; a Liger coffee mug. On one side is the illustration of the Liger as drawn for Deb and on the other side is part of the quote, "Bred for its skills in magic." This mug is a fun way to celebrate the illustration of Napoleon Dynamite's Liger and if you buy one it may just become pretty much your favorite coffee mug! What Is All This Nonsense About? Napoleon Dynamite is a movie that leaves a lot of people wondering, "what was that all about?" It is a movie which does not follow the normal development of a movie and relies a lot on out of context quotes and actions to sustain its humor and watchability. Many people watch this movie once and write it off as stupid. Stupid it most certainly is, but it is a particular brand of stupid that is interesting as the main characters have no concept of how strange they are and this means that they do not even try to conform to fashionable behavior and ultimately this results in them succeeding. Watch this movie with an open mind and I am sure you will laugh. If you watched Napoleon Dynamite once and only really paid attention when it got to the dance at the end, watch it again and I think you will find a lot to entertain you. Napoleon Dynamite is a hero with a difference. He has skills, hunts wolverines and fantasizes about mythical creatures. Even so he is able to run a successful election campaign. 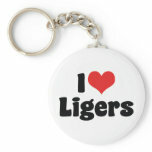 This keychain professing love for the magical Ligers is another neat little gift for fans of this great comedy movie. This Liger keychain comes in a couple of sizes and shapes but this is the cheapest, making it an inexpensive joke for those obsessed with Napoleon Dynamite. 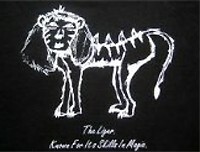 This is what the page is about, Napoleon Dynamite's Liger sketch and here it is again on another t-shirt. This one comes in a variety of sizes, styles and colors so that you can fashion it to your own requirements. The magical Liger is the same on all versions though. You can make your own Liger t-shirt using this print out from the official Napoleon Dynamite website: Iron On Liger Print Out. This is a cool way to make a very unusual t-shirt featuring a Liger. Napoleon Dynamite is the story of a high school kid who is just a bit strange. Here you can find many of the surreal quotes from the movie that make it so popular with fans. I had a chance to watch Notting Hill (1999) tonight on cable, and it was a wonderful experience. I found myself chuckling so many times.